Among the benefits of partner yoga poses is that the presence of another yogi can increase the stretch and intensity of a pose, and can help beginner yoga students learn to balance better when holding certain poses. Below are a couple examples of partner yoga poses that students of all levels can try. The paired up version of this pose essentially involves doing the same thing as its original version - which is standing and balancing on one leg, with the other raised and folded to the side, the foot resting against the opposite thigh. The only difference is, instead of balancing on your own with your palms touching in front of you, you wrap one arm around your partner's waist for balance and you both bring one hand in front of you with the palms touching. Stand with your backs against each other with your legs shoulder-width apart. As you bend your body forward, keep your legs straight, and reach for your partner's arms through your legs. A useful tip for beginners is to bend the body forward and simply reach and clasp your hands around your partner's wrists. To deepen the stretch, you can move your hands further up your partner's forearms or elbows. Balancing poses like the Boat pose can be quite tricky at first because you have to learn a comfortable position on your sit bone while balancing to keep your legs up in the air. In the partner version, first you sit in front of each other with your knees bent and your hands grasping each other's outside the knees. Then lift one leg so your feet are touching sole to sole and simultaneously straighten the legs upward. 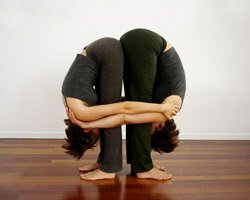 Do the same with the other leg so that your end position has you and your partner's straightened legs and arms forming a letter A when viewed from the side. For this pose, have your partner sit in front of you with their legs outstretched, flat and straight on the floor. Place your feet beside each other's ankles, or under the knees, and clasp your hands around your partner's forearms or elbows. Take turns bending forward with your partner pulling your arms towards them to deepen the stretch.